Should you replace an old refrigerator to save money on energy? When I moved into my home I had to buy a refrigerator. I bought a relatively cheap fridge. My fridge is not an Energy Star compliant model. Whenever I'm at a store that sells major appliances I see the Energy Star models and I wonder if going with an Energy Star fridge would be a good idea to save money. Energy Star has a calculator to figure how much you'd save on energy by upgrading your fridge to an Energy Star compliant model. I used the calculator to estimate what my fridge uses versus an Energy Star model to see how much I could save. My model in the 16.5 to 18.9 cubic foot size range and it was bought around 1999. At 10¢ per kWh the calculator estimates that I'm spending $79 a year. A new Energy Star fridge would run me about $38 per year. Therefore based on the calculator estimate I'd potentially save $41 a year if I replaced my current fridge with a new Energy Star model. I then dug up the actual energy guide for my fridge which was buried in my paper work drawer. My fridge uses 691 kWh/year so thats about $69 per year. The calculator was off by about $10 so its in the right ballpark. Based on my actual fridges energy usage I'd save about $31 a year by upgrading. Of course energy use will vary by exact model so to get the best figure you should find the model # for your fridge and either plug that into the calculator or research its energy usage on your own. I did a quick check on prices at Home Depot for Energy Star fridges. They have a Maytag model that is Energy Star compliant that is on sale for $701 right now. It uses $41 a year in electricity. On the other hand a relatively cheap fridge sells for $449 and uses $48 a year in electricity. Paying extra for an Energy Star fridge isn't worth the extra money. Don't get me wrong, I don't want to discourage people from saving money on energy efficient home improvements. But based on the actual savings an Energy Star fridge is not a good way save energy for its cost. If you want to save energy then consider putting the money into other home energy saving improvements that will give you a better return on the money and potentially save you more energy over all. My fridge is not too old and upgrading to a newer fridge wouldn't save a ton of energy. However older fridges are a lot less energy efficient so replacing them could save you quite a bit. Looking again at the calculator on the energy star site I ran the numbers on some older fridges. If your fridge is from before 1980 and of the 18.2 cu. ft. size then they estimate it is using $210 a year in electricity. You could replace that with a relatively cheap new fridge like the $449 model at Home Depot and cut your energy bill by $162 a year. Thats a 36% annual return on the cost of the new fridge. If your fridge is from 1980-1989 then they figure it is using $163 a year in energy so replacing it with a new model would save $115 a year. Thats a 25% annual return on the fridge cost. If your fridge is over 20 years old or so then it is probably worth it to replace your fridge with a new model. You could get a 25-36% return on the cost of the new fridge. You could start with the calculator to get a ballpark estimate and then I'd recommend trying to check the details on your actual fridge model. The exact energy savings will depend on the exact model of your current fridge. If you get the model number of your fridge then you can put it into the calculator and they may be able to give you specifics for yours. Or if you have the old energy guide document still then it will say the models energy usage. From 1919 to 2008 the average rate for a AAA rated bond was 6%. You'll notice that theres a peak there where bond rates were well over 10% for years and a short period when they went over 14%. From 1973 to 1992 the AAA rated corporate bonds averaged 10% return. By comparison in that same period the NASDAQ went from a value of about 115 to about 600 which is about 9% annual return. So for that 20 year period corporate bonds outperformed stocks (at least the NASDAQ). By comparison from 1938 to 1968 bond yields were fairly low. In that period AAA rated corporate bonds only returned 3.5% per year on average. The NASDAQ on the other hand had a 9% annual average growth rate. So for 30 years from 1938 to 1968 stocks had 2.5 times the growth rate of corporate bonds. Previously I mentioned that the Suze Orman FICO kit was 20% off. Just a reminder that the sale is ending August 31st. "ABC News has a short piece explaining why you shouldn’t “rent-to-own”. This sort of scheme can be convenient for those with poor credit, but “in the long run it is a lousy way to buy something,” says consumer correspondent Elisabeth Leamy." FreeMoneyFinance cautions in Don't Pay for Something You Can Get for Free that there are certain websites out there trying to capitalize on consumer confusion and posing as the AnnualCreditReport.com website then trying to sell you services. An article from Reuters early this hear reports the 10 highest and 10 lowest cars to insure. A number of factors can cause a car to be more or less costly to insure. Main factors would be the rate of theft, high repair costs, or higher instance of medical costs in accidents. The 2008 Chevy Impala will run $1203 for the first year. On the other hand a 2008 Toyota Prius is $1333. and a 2008 Dodge Ram pickup 4x2 is $1411. So you could spend $100 or $200 more on insurance based just on the model of car you drive. When I first bought my house I would turn down the thermostat every night. At least I would try to turn it down every night, but some nights I'd simply forget or fall asleep on the couch or otherwise fail to do it. So eventually I went to the store and bought a programmable thermostat to replaced my old manual dial thermostat. Installing the programmable thermostat was fairly easy and didn't require anything other than a screwdriver in my case. I'd recommend doing it yourself for anyone with a bit of handyman ability. 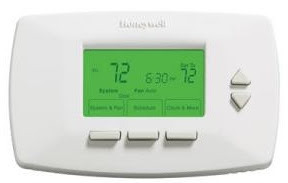 To me the beauty of a programmable thermostat is that it does all the work for you and it never forgets. So with the programmable thermostat I can be sure that I'll never forget to turn down the heat. It definitely makes a lot of sense to control your temperature. The Department of Energy estimates you can save 10% off your annual heating & cooling bills just by turning the thermostat back 10-15 degrees for 8 hours. They also say you can save as much as 1% off your bills by cutting your temperature back 1 degree over 8 hours. The average home spends $1900 a year on energy costs. So by turning down your heat / cooling on average we would save $190 a year. I don't have air conditioning and I live in a fairly temperate climate so my bills are not very high. I figure that I pay something around $800-900 a year to heat my house. At 10% savings for me I figure turning down the temp is saving us $80-90 a year. So its well worth it to turn down our heat. You can buy a programmable thermostat for $40-$100 depending on what kind of features you get. So for both the potential energy savings and the convenience factor of having it automatically set, a programmable thermostat is well worth the cost. Alternate version to above article is now found at Fixr site. Shortly after I bought my home about 9 years ago I bought and installed compact flourescent lamps (CLF) in almost all my light fixtures. I don't recall exactly how much I spend because it was years ago. I am guessing that I replaced around 10-15 bulbs total and I probably spent $50 to $100 to buy them. The CFL's were more expensive several years ago and their prices have dropped quite a bit. To many people CFL's may be old news. They've been around for years and are gaining in popularity. Personally I think CFL's are one of the easiest ways to save some money on your electric bills. CFL's save you money in two ways. First they use much less electricity. 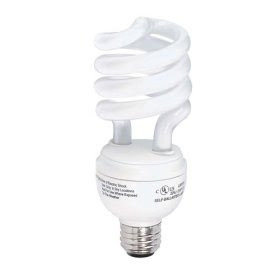 CFL's use about 20-25% of the electricity of a normal incandescent lamp. Second they last a lot longer so you save from not having to pay for new bulbs. I figure that I typically have an average of 3 bulbs on when I'm home in the evening. I probably spend an average of 8 hours a day at home at night. 3 bulbs saving 70W at a time is a 210W savings. If you save that much for 8 hours a day then its 1680 W/hrs or 1.68 kWh daily. Annually that adds up to 613.2 kWh. My electricity runs just about $0.10 per kWh. So roughly speaking I'm saving about $61.32 per year on electricity. CFL's last about 10 times as long as a normal bulb. The lifespan for a CFL is typically 10,000 hours and a normal incandescent bulb is around 1,000. CFL's can typically be bought for $1-2 each nowadays. You can get a 12 pack of 13W Sylvania bulbs for $20.32 which comes to $1.69 each. Incandescent bulbs would have to cost less than $0.17 each to be cost competitive. Across 10 bulbs installed in a house you'd easily be saving $1 or more a year in lower replacement costs. Since I bought my bulbs about 9 years ago and I've saved over $61 a year in electricity I've already saved over $549 in electricity. Minus the cost of buying the CFL's, I'm ahead at least $449 already. The high price of gasoline has hit us all at the pump. Today's average price is $3.69 and just a month ago it was over $4. Another place we use gasoline is with our lawnmowers. You can save money by using an electric lawn mower instead of a gas powered one. "An efficient gas mower will use ¼ of a gallon of gasoline per hour." So that means that a half hour mowing job like my lawn will take 1/8 gallon of gas per mow. I have to mow the lawn half the year where I live so thats about 25 mows per year. If I were using a gas mower that would equate to 3.125 gallons of gas per year to mow the lawn. At an average cost of $3 per gallon that is $9.37 per year in gas costs for an efficient gas mower. My electric mower is a 1000W model. So I'm using 1000 W x 0.5 hours or 0.5 kWh per mow. With 25 mows a year thats 12.5 kWh per year. My electricity costs $0.09 kWh so this means I'm spending $1.125 per year in electricity to mow my lawn with my electric mower. TO keep this practical you'll have to have a relatively small lawn that can be handled by an electric mower. Also the cost of the electric mower shouldn't be significantly higher than the gas version. By my count I've got 150 posts up now. Are Wood Pellet Stoves Financially Practical? Why Spending $700 on a HD Tivo is a good idea. Hot water is a pretty significant cost for home utilities. A little while ago I bought a small attachment for my shower at home that automatically cuts down the water flow to a trickle once the water has heated to 95F. The Energy saving 'Ladybug shower adaptor' that I bought cost $30. They also have a combined Low flow shower head plus energy saving showerstart for $40. The products literature cites a $0.03 cost per gallon for hot water. I found a similar figure with the Shower Savings Calculator. I normally run my shower in the morning waiting for the water to heat up. The shower is on the opposite end of the house from the hot water tank so it takes a while for the water to travel the pipes and get the hot water at the shower head. While I'm running the water I tend to take care of other morning activities such as brushing my teeth, etc. So I'm usually wasting a little bit of water since I'm not standing at the shower waiting to start showering the instant that the water is sufficiently heated up. Now however with the attachment installed it will shut down the water flow when the shower is heated up. 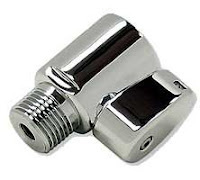 This saves by not sending wasted hot water down the shower drain. If I save just 1 gallon a day its $10.95 per year and 2 gallons a day is $21.90. With two people using the shower right now I'm easily saving $20 a year with this attachment. Plus theres added convenience of saving a little time by knowing exactly when the shower water is hot and ready to go. Plus I'm saving water. Previously I decided that pet insurance wasn't a good buy financially. The policies out their paid out too little for how much they cost. I couldn't see spending $100-300 a year over the life of a pet for a policy that would only pay out $1000 or so if you ever needed it. But I think it makes sense to get a vet policy if your pet is older. Life expectancy of indoor cats is around 15-20 years now. But you have to shop around for a good policy for an older pet. The insurance plans may either not cover older pets and/or they may increase the premiums significantly. VPI pet insurance charges $128 annually for a 6 year old cat and $166 for a 9 year old cat. But they won't offer quotes for pets over 10 years old. Pet Care Insurance has a policy specifically for older cats called QuickCare Senior. They also have a policy for indoor cats called QuickCare indoor. I was able to get quotes on both of these plans for cats of any age. I even tried a cat thats 22 years old. Also the monthly premiums don't increase with the age of the cat. Their indoor cat plan is fairly reasonable at about $12 a month. They pay up to $2500 per incident for several illnesses with a $200 deductible. Pets Best Insurance will also cover older cats. I got a quick quote for a 20 year old cat and their basic coverage was $24.62 a month. That plan has a $100 deductible and $2500 per incident limit. They have higher limit plan that covers up to $7000 per incident but it runs $40.20 a month. The QuickCare Indoor policy from Pet Care Insurance looks like the best deal to me. For $144 a year you get coverage up to $2500, however the plan has some restrictions on its coverage. The specifics for your pet would vary so I'd make sure to shop around and read the full insurance policy. When a pet gets older it gets more likely to have a severe illness. For a cat or dog in their later teens the chances of a $1000 or $2000 vet bill get pretty high. Considering the high likelihood that you'll be facing a large vet bill for a teenage pet it makes sense to pay $100 or $200 a year for an older pet if you can get a $2000 or more in coverage. The other day Free Money Finance raised the question of how much would you be willing to spend to save you pets life? I think its a pretty tough question. For me its a matter of how much I think is too much to spend. Thankfully I have the resources to cover almost any kind of vet bill we might encounter. But for many Americans if they are hit with a high vet bill they simply may not have the money to afford it. They are faced with the choice of cutting back their quality of life, going into debt or euthanizing a loved pet. For a beloved family pet this can be a very difficult situation to deal with. First I would make sure to shop around a little and get quotes on the cost from multiple veterinarians. The prices charged by vets can vary widely. If it is an emergency situation than first ask your vet if they know of more affordable vet services, they may be understanding and quickly refer you to a lower cost peer. Second I'd ask the vet(s) if they can help subsidize your costs, help with financing payments or know others who can help you. If you explain that your financial situation won't allow you to pay the full bill up front then the vet may work with you to reduce the rate or at least provide an option to pay over time. They may also know an organization that can help. Finally you can look into getting help from non profit organizations. There are a number of charities that offer assistance to help people with financial need pay for their vet bills. It is important to understand that the cost of a pet can potentially include a substantial vet bill. You should keep the cost of vet bills in mind when you are getting a pet. If you have lower financial means then consider at least buying a lower priced pet. Cats are generally less expensive than dogs. Keep your cat indoor to improve their chances of a longer, healthier life. A small bird or rodent is even less expensive. Is joining the Columbia house DVD club a good deal? I've been a member of the Columbia House DVD club for years. Previously I compared buying DVDs on Columbia House as an existing member versus buying at Amazon. But I didn't look at the sign up deal you get with Columbia House when you first join. Thats a total cost of about $109.40 for 10 movies or around $11 per DVD. So the DVDs on Amazon are typically around $13.5 to $17 each. I am not including shipping on the Amazon DVDs since generally their DVDs qualify for free shipping with orders over $25 so you could get free shipping if you by 2 DVDs at a time. If you joined Columbia House DVD club as a new member then you would save about $25 on the purchase of 10 DVDs compared to buying them on Amazon. In my opinion it is certainly a good deal to sign up for Columbia House as long as you're pretty sure you'd buy at least 10 DVDs over the next 2 years. A little while ago I bought an Energy Saving Smart Strip With Autoswitching Technology Using this strip I've figured that I'll be saving over $18 a year in electricity. The strip costs $26.41 at Amazon so you can recoup your investment in about 16 months. The strip is designed so that if one 'control' device is off then other outlets on the strip will have no power. This is a good way to automatically power off for accessory devices like the printer and monitor on your computer or the DVD player and cable box for your television. So for example when my computer is powered on the outlets for the printer and monitor will have power but when the computer is turned off those outlets will be unpowered. The key benefit of the power strip is that it keeps your unused electronic devices from leeching power even while they are turned off. Many of our electronic devices have standby modes and while they are turned off they can draw anything from a fraction of a Watt up to 5 or 10 Watts. thats power that is always on and always costing us money. I measured the usage of the devices with a power monitor device. I got this one: P3 International Kill-a-Watt electricity usage monitor . It plugs into your AC outlet and then you plug the device you want to measure into the monitor. It has output display for voltage, watts used, amps used and a meter to measure total killowatts/hour used. So you can plug a device in and easily see how much wattage the device uses. Or you can plug a device in long term and see how much power in terms if kW/hr it uses. Its great for figuring your electricity usage and costs per device in your home. With the kill-a-watt monitor I measured the power consumption of my computer peripherals. I have 2 printers and 2 monitors setup. The printers use 2-3 watts each. My older CRT monitor used 4 watts and the new LCD monitor used just a fraction of a watt. I also have a 19" CRT television and DVD/VCR player setup near my computer that I sometimes use to watch TV while I'm using the computer. The 19" TV uses 8 watts while off. The DVD/VCR seemed to use a fraction of a watt. After measuring all my devices I picked the items that used the most power and connected them with the smart strip. In total the devices used about 21 Watts total. I also checked the power consumption of the electronic devices setup in my living room and connected to my main TV. I have a big screen TV with a cable box DVR, Tivo, stereo amplifier, HD DVD player, DVD/VCR player and a Nintendo Wii. The cable box and Tivo have to remain on all the time in order to record shows unattended. The stereo amplifier and HD DVD only used a fraction of a watt each. The DVD/VCR used about 3 watts and the Wii only used 1 watt. The exact amount of energy you will save will vary a lot and will depend on the specific appliances you are using. Heating water in your home is one of the larger expenses for energy. According to the DOE, Water heating can account for 14%–25% of the energy consumed in your home. Your normal water heater has a 40, 50 or maybe 80 gallon tank full of water that it keeps hot all the time. Then whenever you need hot water it has it available to send to your faucet. But because the water heater has to keep the water hot it spends energy constantly to do so. 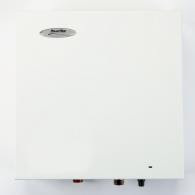 An alternative to your normal tank water heater is a tankless water heater. The tankless water heater will heat water as you need it on demand. It has no tank and therefore doesn't have to spend energy keeping water warm around the clock. From the Dept. of Energy website they say: "For homes that use 41 gallons or less of hot water daily, demand water heaters can be 24%–34% more energy efficient than conventional storage tank water heaters. They can be 8%–14% more energy efficient for homes that use a lot of hot water—around 86 gallons per day." 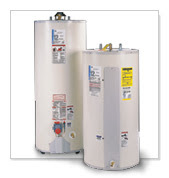 Tankless water heaters for a typical 2 bathroom home will run you around $650 ballpark. Home Depot has a PowerStar AE125 model for $649 and Lowes has the same AE126 for $688 That model provides 4 gallon/ minute which should suffice for most 2 bath homes. By comparison a normal 40 or 50 gallon tank electric heater will run you around $300-400 ballpark. Lowes has a 50 gallon tank for $397. So the tankless heater costs about $300 more than an equivalent tank water heater. The 40-50 gallon tank water heater will cost you around $400 a year to run. If you save 10-30% of that then a tankless heater would give a $40 to $120 annual savings. If you were to spend $650 for the tank plus additional labor costs today to replace your tank water heater then the $40-120 savings may not be enough to justify that expense. However if you need to replace your tank water heater then spending an extra $300 for a tankless model would be justified. I was pretty pleased when I saw the other day that I was up 5% on Updown for the year. I looked at it again today and right now I'm only up 2.9%. By comparison the S&P 500 is down -4.7% since I started. So I'm 7.6% ahead of the index since March 20th. Thats not bad. My line is blue in the chart and the S&P 500 is green. Right now I'm a ways ahead of the S&P. But look back at the period from 3/20/08 to around 6/19. 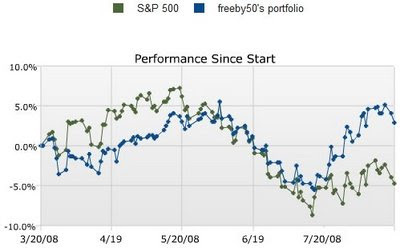 In that 3 month period my performance was either below or roughly equal to the S&P. Its only the past 2 months that I've really pulled ahead of the S&P. So on one hand you can say I'm 7.6% ahead of the S&P. But if you look at it another way you could say: In 5 months I've been outperformed by the S&P 500 about 60% of the time. The real test will be over a longer term period. How will I do in 12 months or 3 years? Also comparing my stock picks to the S&P 500 isn't such a great benchmark. Would you dump all your money into the S&P 500? I'd look for a good mutual fund. For example the Jennison 20/20 Focus Z (PTWZX) mutual fund sold for 13.86 on March 19 and is now selling at 15.49. So they are up 11.7%. CGM Focus (CGMFX) is listed has having the best 1 year returns on the Yahoo site. CGM Focus was going for 46.59 on Mar. 19th but is now down at 45.75 so they are down 1.8%. Still you could do much worse. Browsing at Yahoo they have a page of mutual funds with the highest loses. Fidelity Select Home Finance (FSVLX) was at 25.92 on March 19th and is now at 16.76. Thats a whopping 35% lost in just 5 months. The fund specializes in mortgage securities and was hit hard by the impact of the sub prime mortgage mess. One of the funds was Frontier Microcap (FEFPX). Motley Fool has an article calling it the Worlds Most Expensive Mutual Fund. Not only do they have a 4.5% sales load but the expense ratio is at a boggling 18%. What a rip! But I can't find much information on the recent price history of that fund so I'm not really sure its actively traded now. Of course these last two examples of Fidelity Select Home and Frontier Microcap are the worst case scenarios. Skimming over the Vanguard funds it looks like the median 1 year return is about 4%. Overall I think my results fall somewhere in the middle if I compare it to mutual funds across the board. I'm using UpDown as a learning tool. I'll continue to play with my stock picking strategy and see how it plays out for me over the long term. If nothing else its gaining experience but without risking real cash. The other day I was talking about shopping around for car insurance. I took my own advice and ended up saving quite a bit. I have a classic car. Its a fully restored Dodge from the 1960's. Its a fun car to own and drive. Since its a classic car I do not drive it regularly and usually only take it out a few times a month during the summer. The car is a classic so its not depreciating and its likely to at least hold its value if not appreciate in the future. I bought it over a year ago and have already had an offer from someone willing to pay $3k more than what I bought it for. Ok admittedly these are mostly excuses to myself to rationalize buying what amounts to a big "toy" but I feel its better to go with a classic than a newer car so you at least don't get hit with depreciation. But as with any car you have to have it insured. When I originally bought the car I just had my insurance company add it to the existing policy that I had for my main car. I was in a rush or just being lazy and I failed to shop around originally. With my normal car insurance policy I was spending $313 for 6 months or $626 annually. I get a high liability limit and I had the car fully insured for collision and comprehensive. I might have been able to save a bit by shopping around with other insurers. But the main problem was that they insured the car as if it were a normal daily driving vehicle. They probably assumed I'd be putting 10,000 miles or so on the car each year like most people do with their cars. But since the car is a classic car I drive it less than 500 miles a year. What I needed was a car insurance policy that was specially designed for classic or antique cars. Thats where classic car insurance comes in. There are a few insurance companies that specialize in classic car insurance. A couple I found were Hagerty and Grundy Worldwide. These companies know that classic and antique cars are not driven frequently and are generally very well taken car of by their owners so the companies can tailor more cost effective insurance policies for this niche market. They offer features of the policy that are more suited to classic cars such as full value replacement, agents that understand classic cars, choice of repair shops, flat bed towing and many other such features. I did some searching to try and check out the options for companies. I found a review of Hagerty online. I also found this blog article about Hagerty versus Grundy that has a positive experience with Hagerty : "They paid quickly when my 1965 T-bird burned up and it was a "no hassle" settlement and that means quite a bit." I also liked the webpage for Hagerty. In the end, Hagerty insurance is the company that I settled with. I got a quote from Hagerty online. They do have specific requirements and ask questions about how much you drive the car, if its garaged, if you use it as backup transportation, etc. They also require details of your normal insurance policy for your regular use vehicle. I ended up having to call them to ask a question and the customer service was excellent from that one interaction. They answered quickly and were very friendly and efficient. My policy was quickly approved and they e-mailed me the insurance cards right away. Overall I had a great experience with signing up with Hagerty. The best part though is the price. For 1 year of coverage I'm paying just $156 with Hagerty. Thats a $470 annual savings over my regular policy from Safeco!! Obviously this kind of thing won't help most people save money. Few of us have classic or antique cars they need to insure. But you might have a motorcycle or RV or other unique vehicle and it might help to shop around for a specialty policy or separate policy. A while ago I mentioned that I was playing the market on UpDown.com Well since I signed up I've done fairly good in my opinion. Since starting in March I'm beating the S&P 500 by 7.59%. My portfolio is up 5.23% and the S&P is down -2.36%. Annualized my current return rate is 12.89%. Updown also pays users if they beat the S&P. I've received payments for two months so far. In June and July I made $0.36. The money is not much but playing the game is still fun. Its also valuable learning experience in picking stocks without the risk of actual loses. If you're interested in picking stocks then I'd recommend giving UpDown a try to use as a testing ground for your stock picking strategies. Keep in mind that experiences over a short period like a few days, weeks or months is not really going to give you a clear picture of how well you might do. This is a review of The Complete Idiot's Guide to Getting Rich. It is by Stewart H Welch III and Larry Waschka. I read the 3rd edition of the book. Here's the description from the publisher: "With advice on investing, saving, and money management, the latest edition of this popular guide expands on the habits and strategies that will bring financial success. The authors present succinct and complete information on knowing the wealth index, using the debt pyramid reduction program, hiring financial advisors, and more." I have to admit when I picked up the book the title made me a bit cynical. "Getting Rich" seemed much too like "get rich scheme". But don't let the title fool you too. The book is full of legitimate financial advice with methods for developing wealth. There was one good quote in the book that ensured me it wasn't a gimmick book: "Building wealth is not about buying fancy cars and clothes. Its about living within your means." 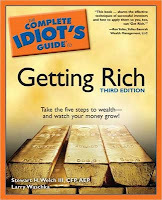 As the title suggests The Complete Idiot's Guide to Getting Rich is focused on obtaining and growing wealth. Its a decent overview as you'd expect from a Complete Idiot's Guide title. The first part covers the basics of getting rich with intro topics on what it means to be wealthy, tools for building wealth, their 5 stages of wealth, good versus bad debt, saving money, secrets of millionaires and getting rich as an employee. Part two covers investing. There is a chapter that discusses 'fools' gold' or investments to avoid, list of good investments, getting into the market, building a 'brain trust' of advisors (CPA, lawyer, insurance reps, financial planner), and then 'advanced' investment strategies. Part 3 goes into running a business, Part 4 is about building and preserving wealth with topics on real estate and taxes. There were a few bits from the book that I found particularly interesting. One of them was their 5 stages of wealth. Stage 3 : The return on your investments is enough to meet your living expenses. Stage 5 : Return on investments is 5 times your expenses. I like this way of thinking about it. I personally think that defining and setting progressive goals that you can work towards accomplishing is an excellent way to get where you want. So I really liked this way of splitting up the road to wealth. More than once in the book they disagreed with the conventional wisdom of investing a portion of your investments in bonds. The old rule is to subtract your age from 100 and that is the percent you would put in stocks and that the rest should be in bonds. The authors of the book however feel that people will live longer lives and that the old rule of thumb is outdated. They recommend putting all your investments into equities and they say that this is the best way to ensure your return is enough. When they discussed running a business they have full chapters on avoiding the #1 and #2 reasons that businesses fail. The #1 reason they say is lack of capital and the #2 reason is poor management. In the real estate section they had an interesting idea on using a real estate investment to help subsidize college expenses for you children. They suggest buying a house with a few bedrooms near your child's college and then having your child live there and renting out the other rooms. There are a few benefits to this idea. First your child has a place to live and renting out the other rooms should cover the mortgage. Second you get tax benefits of owning rental property. Third you should see some equity appreciation in the property over four years. Finally your child gets some valuable experience while managing the property. On the negative side, I found the organization of The Complete Idiot's Guide to Getting Rich slightly awkward at times and the editing could have been a touch better. For example, on page 200 they said that 80% of small businesses fail and then on page 208 they said that 90% of small businesses fail in the first year. I would recommend The Complete Idiot's Guide to Getting Rich if you're at the stage in life that you're looking ahead to building real wealth. It has a lot of good content with some interesting ideas. It has some good solid advice to use when planning to build your own wealth. Look for it in your local library. MyFICO is running a sale on the Suze Orman FICO kit. The promo code is good until August 31st. The Suze Orman Kit comes with FICO scores for all 3 major credit bureaus. Individually those scores cost $16 to get or $48 for all 3. So getting the Suze kit for 20% off would be about $40 or about $8 savings just for the scores. Suze's kit also has other features on top of just the FICO scores. I have not used the Suze Orman kit myself. I do try and use the annualcreditreport.com site which is the one setup by the credit bureaus themselves to give you one free credit report a year. Its good to check your free credit report annually to be sure your information is correct. It is also good idea to keep an eye out for unauthorized activity that is a sign of identity theft. However the annual credit report site only gives you credit reports which are not the same as your credit score. You can only get the FICO credit scores by paying. Take note though that annualcreditreport.com is the only authorized source and other sites might try to look like it and are just selling products. 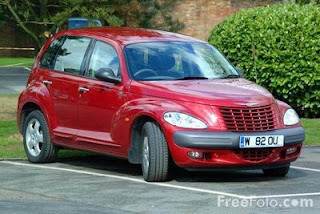 "...if you use your car to drive around clients, for example, you’ll have some extra value from having a shiny new car. If you’re in that position, your decision is probably pretty easy. There’s added value for you to constantly have a newer car, so buying a car on a lease is likely the most effective way to go." I still think that more often than not a lease is going to be the worse financial choice. However when you are in the situation where you do need a new car for your job then a lease might at least be worth a second look. Usually this would mean someone who is in sales. First of all if you're a salesman then your company may give you a leased car as a company benefit. If theres no other options available then this is a no-brainer. You're getting a car for free and the company is maintaining the lease and making the payments. However some employers may give you the choice between a cash payment to purchase your own car and a leased vehicle. In this situation I'd compare buying a new car and taking the leased vehicle. If you are a salesperson and looking at a lease that you finance yourself then I'd pay special attention to the mileage restrictions on lease terms. Usually leases have pretty strict limits on mileage over the term of the lease and also have high fees per mile if you go over the mileage limit. Salespeople typically drive a lot so they would be likely to exceed a low mileage restriction and then end up owing extra money at lease closing if they aren't careful. In any case I think you should compare the terms of a lease to the costs of purchasing a new car to evaluate the two options. To do so use a lease versus buy calculator. Make sure you get all the numbers beforehand and do the comparison in advance of going to a dealer to make a purchase. If you go to a dealer then you will be shown payment numbers for a lease and it may be very difficult to figure out how well exactly the lease compares to buying new. Also don't fall for an advertisement that only cites a low lease monthly payment. The TV ad may say: "Just $199 a month for 36 months" and if you look at that and compare it to a $438 monthly payment for buying new then the lease may seem more attractive. But if you look at the lease terms closer you may see you have to pay $1295 down, a $500 security deposit and that the annual mileage limit is only 10,000 miles. Those details make a significant difference in the financial comparison and its hard to compare these without the aid of a calculator. You should really make sure you know all the fine print details of the lease terms up front. You can check the car manufacturers website to look for details on lease programs and incentive interest rates. Ford has a payment estimator that even lets you directly compare a lease versus buying new. Its possible that a lease might workout as a potentially better option in the unique situation where you need a new car for work and can't make higher payments. But generally I believe that the lease is going to be the worst choice. In any case I'd recommend getting all the details of the lease terms and using a calculator to compare lease to buying. Which is the better AmEx card: Blue cash or TrueEarnings? If you have a Costco membership then you may have seen their TrueEarnings AmEx cards advertised there. But theres also the Blue Cash rewards from AmEx that has pretty good cask back rewards as well. Both of these cards could net you a pretty high cash reward. But which is really going to be better for you, the TrueEarnings or the BlueCash?? Earn 2%cash back for travel. Earn 1%cash back everywhere else, including Costco. No minimum on how much you have to spend. No limit on what you can earn with the TrueEarnings Card. Cash back earnings accumulates over the course of the year and the total is issued to you in your February billing statement. 'Everyday purchases' are for Gasoline, supermarkets and drugstores. Comparing the two, the TrueEarnings card is a great deal for restaurant and travel spending. The Blue Cash card gives you really good reward value for higher spending and for spending at supermarkets and drugstores. Both give a great reward at gasoline purchases and have no annual fee. However note that the TrueEarnings card doubles as a Costco membership so the Costco annual membership fee is tied to the card. First a couple rules of thumb: If you don't spend at least $6500 then don't even bother looking at the Blue Cash cards. For those to be worthwhile you have to spend more than $6500 to get the high % reward rates to kick in. Because of the Costco membership fee, If you don't have a Costco membership then the TrueEarnings cards probably aren't a good option. In general if you spend a lot more in restaurants and travel then the TrueEarnings card is probably your better bet, but if you spend a lot more at grocery and drugstores then Blue Cash will likely get you more. Its best to estimate your annual spending then compare the actual rewards you'd get from each card. The Blue Cash reward is more complicated to figure given that a portion of the reward is below $6500 and a portion is above and theres different % rewards for each. I'd recommend just using the Blue Rewards calculator at the AmEx site. Example: Lets say you spend $2400 a year on eating out, $3000 a year on groceries, $4000 a year on gasoline, $1000 a year on travel, $500 at drugstores and $2500 a year on other expenses. But if I plug the values into the Blue Rewards calculator then I get a reward of about $286 for the Blue Rewards card. In this case the Blue Cash card would be better. Of course this is just an example. Your mileage may vary. I would consider your own spending and compare the two cards. I compared the figures for myself and found that the TrueEarnings card will give me a better reward. I'd get about $60 more each year with TrueEarnings. I do better with the TrueEarnings primarily because I have a fairly high budget for restaurants. Buying a used efficient car can save typical Americans thousands a year. Previously I discussed what a typical family spends in a given year. For transportation a typical family spends over $7000 annually on two cars. Car purchase was $3000, gasoline was $1,997 and other expenses were $2,146. In my mind this is way too much for a family to spend. My last car was a 2 year old used 1995 economy model that I bought in 1997. I paid about $7,000 and drove that car for 10 years. I then sold it for about $1,000. The car got 29 MPG average and I drove it about 80,000 miles in those 10 years. I got the oil changed regularly around every 3k to 5k miles. I think I spent around $1000 to $1500 total in repairs other service. My insurance rates were around $600 a year give or take. So compared to a typical American my vehicle cost $2,000 less per year. Why was it cheaper? It was inexpensive, used, efficient and I drove it for 10 years before trading in. Lets look at another example. Previously I discussed fuel efficient used cars. One of the cars from the Consumer Reports list is the 1998-2000 Toyota Corolla. According to Edmunds you can get a 2000 Corolla for $5600-5900 price range. If you bought one and then drove it for 5 years you should be able to sell it for around $2,000 or more. If you buy it for $5,900 then drive it 5 years and sell it for $2,000 your cost is $3,900 over 5 years or $780 per year. Compared to the typical expense of $1,500 annually per vehicle this is a $720 annual savings. Since you are buying a fuel efficient car your gas expenses will go down too. The typical family spends about $2000 annually in gas (for the year 2006). I believe the average auto gets about 20 MPG. The Toyota Corolla averages 30 MPG. So with the Toyota the average gas use will be more like $1,333 a year. Thats a $667 annual savings in gasoline compared to average. Over two vehicles thats a $333 annual savings per vehicle. The 2000 Toyota Corolla is just one example of an economical used car. Between the cost of the car and the gasoline savings if a typical American family switched to two 2000 Corollas they'd save $2,107 each year. Even if you don't have $5900 on hand right now you could finance the purchase of a $5900 car and your monthly payments would be $114 at 6% for 5 years. Even financing the purchase its still $432 less than what typical Americans spend annually on car purchase. Saving $2,000 a year on a car makes a big difference. 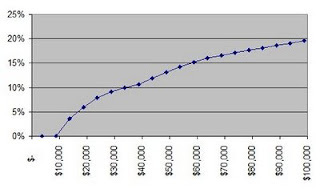 For a typical family making $42k annually this represents 4.7% of annual income. In order to figure out how best people can save money we first have to know what people spend money on. So it will help to answer the question: What does a 'typical' family spend their money on? 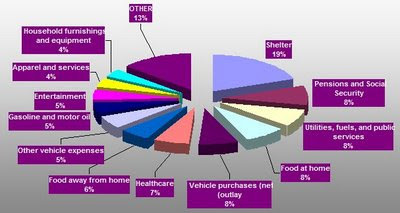 The Bureau of Labor Statistics performs a consumer survey and complies data on what consumers spend money on. This information is summarized in the latest report: Consumer Expenditures in 2005 If you look on page 7 of the document Table 1 shows expenditures broken into income quintiles. I'll look at the third 20 percent quintile as a 'typical' middle income family. The 3rd quintile makes $42,622 before taxes and has 2.5 family members. Obviously everyones individual spending will vary, but these are typical average values. I should note that these are not the average figures or exactly the median figures. They are the figures for the average of the 20% of Americans in the middle. The figures here are close to the median but not exactly the same. Average values would be a bit higher because they are skewed upwards by very high income earners. I think that looking at the average for the people in the middle is a very good way to represent the spending for 'typical' Americans. Another dataset on spending from The N.Y. Times. The BLS Consumer Expenditure Survey site. A lot has been written on comparisons between traditional IRA accounts and Roth IRA accounts. Its a fairly common question to decide which is better for a given person. Suze Orman is very gung ho on the Roth IRA and she seems to recommend them a lot. If you have a 401k employer match then go with that first. An employer match to a 401k is free money and you can't go wrong there. So if this is an option for you then the 1st priority is to contribute to the 401k up to the match level. If your tax level is currently very low then a Roth IRA is a good choice. Lets say for example that right now you are single and making $25,000 a year. Your tax bill in in the ballpark of $2,000 or about 12% range. That is a very low tax rate and its very likely in the future you'll be looking at a higher rate. So it would make more sense now to contribute to a Roth IRA with after tax dollars and then not pay taxes in the future. But lets if you don't have an employer matching 410k plan and you aren't in a very low tax rate presently then the choice between a traditional IRA and Roth IRA gets less clear. Lets look at the pros and cons of each. Your future tax liability is zero. If taxes go up in the future then it will not impact you. You can withdraw your contribution money from a Roth for anything. If taxes go up in the future then you'll be paying more then. Better if you have a lower tax rate in the future. If you look at the differences the big unknown that matters here is whether or not tax rates go up or down in the future. The common feeling I've seen lately from people like Suze Orman is that its likely that tax rates will be higher in the future. Suze and others say this is more likely since we've got looming debts and our nation is facing higher bills for social security. So they expect taxes to go up in the future. But how can anyone know what will happen 20, 30 or 40 years from now? We simply can't. Its possible that the nation might eventually switch over to some sort of flat tax system which would change the picture entirely. Your individual tax situation may not be the same as the national direction. So I think we really can't tell what taxes will do for us either as a nation or individually and its anyones guess. Personally I think the traditional IRAs do offer tax benefits for most people. I generally think that people spend less in retirement. This means they'll have lower tax burden. This is a good reason to go with a traditional IRA. So we come back to the basic question, are traditional IRA or Roth IRAs a better option? Since I think each has benefits for certain circumstances and we don't know what will happen in the future my answer is : Why not utilize a mixture of both traditional and Roth IRAs?? If you have both a traditional and a Roth IRA you have the flexibility to draw money out of the one that suits your tax situation at the time. Flexibility of using both could allow you to maximize your tax advantage in the future. Here's some examples of what I'm talking about: Say 30 years from now you retire. You've got $500k in a Roth and $500k in a traditional IRA. Lets say that a new administration takes office in the White House and a tax bill goes through lowering taxes to help shore up social security. At that point you might start taking money out of the Roth IRA only and leave your traditional IRA alone. Then after 8 years the other political party regains office and the social security problems are resolved and they lower taxes again. Then it might make more sense to switch to using your traditional IRA funds and leaving the Roth funds alone. Another example: Say you've got $100k in a Roth and $100k in a traditional. Maybe you've also got $100k in stocks you bought at some point. If you decide you want to sell off those stocks it might give you a high tax bill that year. If you pull money out of the Roth that year it won't push you into a high tax bracket. If you only had a traditional IRA then you wouldn't have this option. Given the progressive tax nature you could use a combination withdrawals from a Roth and traditional IRA and maximize the situation so you still have zero tax liability. Given today's tax rates here is an illustration: Say you make $25,000 from social security each year and want to supplement that with $40,000 total withdrawals from your retirement. If you only had a traditional IRA then all your withdrawals would be taxable. Your total tax bill would be $4,241 for a married couple. That's about a 10% tax rate on the withdrawal ignoring social security. If on the other hand you had both Traditional and Roth IRA accounts and pulled $20,000 out of each then only the $20,000 from the traditional IRA would be subject to taxes. Since a retired couple has standard deduction and exemption and since your taxable income isn't too high your total tax bill would be almost zero at just $40. So in this situation, by finding an efficient way to take advantage of tax deductions and exemptions you would be getting a tax free withdrawal from your traditional IRA funds as well as your Roth IRA. One big reason I think going with both forms of IRA is that it helps you hedge your bet against what taxes might look like in the future. If you went with a Roth IRA only and taxes happened to be lower in the future then you'd make out poor or if you went with a traditional IRA and taxes increased in the future it would also be worse. But if you've got some of each traditional IRA and Roth IRA then no matter if taxes went up or down you wouldn't be in the worst situation. Going with a combination of both traditional and Roth IRAs helps you hedge your bets against future changes to tax rates. It gives you flexibility to withdrawal funds for the best tax advantage at the time given the rates or your individual financial situation. I think going with a combination of both traditional and Roth IRAs is a safe bet. I checked prices at Costco and Safeway. Costco had 24 count of 8oz bottled H2O water for $12.57 or 52¢ each. Safeway had a 6 pack for $2.50 or 41.6¢ each. So as an example, if you drank just one bottle of water a day and bought them for 40¢ each you'd be spending $146 annually. Or you could get a filter system at home to filter your own water. There are a lot of different options for filters. The easiest/cheapest I think are the pitchers from Britta or Pur. I have had a Britta pitcher before and it works fine. Now I have a Britta filter that attaches directly to the tap on my kitchen sink. If your refrigerator has a water dispenser built in then it may have a filter in it as well. You can get a Britta filter 10 pack for $45.50. They have a pitcher for $11.99 If you get the pitcher and 10 pack of filters together on Amazon then they cut the price to $57.49 for the combo. Each filter handles up to 40 gallons of water or 2 months. So between the pitcher and the 10 pack of filters thats 400 gallons of filtered water for a total cost of $57.49. Thats about 14¢ per gallon. That would give you a 32 ounce serving of filtered water for about 3.5¢. Over a year if you drank 32 ounces a day that would equate to an annual expense of $12.78 if you used 40 gallons or more a month. Or worst case if you had to replace every 2 months then that would be about $34.49 per year. So you're you're looking about around $13-35 a year for filter replacement depending on how much water you use. Using a water filter pitcher at home could save you $110 to $133 a year. In addition to saving money you also reduce the amount of plastic that is wasted.